The late Do Ho's daughter, Dayna Ho-Henry, has been found dead on Hawaii's North Shore. The 51-year-old's death comes less than a week after the Waikiki Beach funeral for her father, who died April 14 of heart failure at age 76. 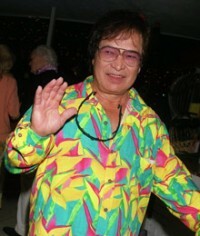 Ho-Henry was one of 10 children of the legendary Hawaii entertainer known for his catchy signature tune "Tiny Bubbles." No foul play is suspected, said Michelle Yu, Honolulu police spokeswoman. "She was not responsive this morning and was pronounced dead," Dwight Ho, 46, told The Honolulu Advertiser. "We're having a hard time. We're just trying to pull together, get everybody together. We're terribly sad and trying to cope." Honolulu Medical Examiner's office said Friday afternoon that it had no information to release about the death.